The Media Center was designed to support a wide variety of audio, video & graphics projects and the specialty spaces a perfect to help. Don’t let the small space fool you, the nooks are a student favorite for audio projects of all sorts. 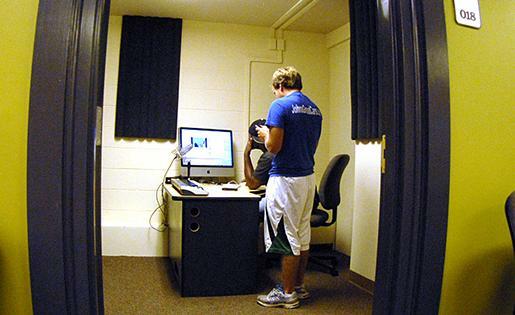 With a quiet space to work and various programs like Garageband and Audacity, students and faculty alike come by to do podcasts, music recordings, and other media or technology-related projects. If you need a quiet space to work on an audio project for you or for a small group look no further than a Podcast Nook. with 24 windows-capable Macs, the Microroom is great for late nights and classroom synergy alike. What exactly is the studio used for? CNN News Conferences via Skype with students and faculty, jam sessions and music recording using top-end programs and equipment like Logic and top end audio mixers, video projects using the dolly or greenscreen, video conferencing, Xbox Kinect battles, just to name a few. 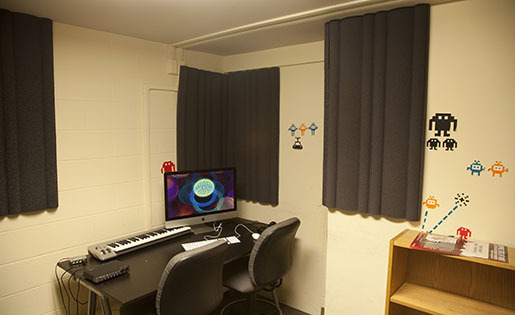 The Studio is a partially soundproof space for students to work on creative projects (especially music), show movies, shoot footage, and also a place for faculty to hold occasional video conferencing and once in a while have Dickinson figures like PJ Crowley or Nasim Fekrat hold big news interviews.